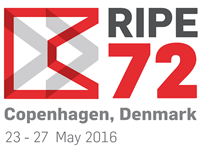 Colin Boekhout and John Hill will be heading out to Copenhagen for the upcoming RIPE 72 event. The event takes place at the Tivoli Hotel and Congress Centre from the 23rd – 27th May 2016. The meeting gives Internet Service Providers (ISPs), network operators and other interested parties the chance to gather to discuss issues of interest to the Internet community. If you are interested in meeting with either Colin or John at the event, email info@console.to to book your meeting in advance.